Goldfish survive below-freezing temperatures by going into hibernation, but only if they receive plenty of oxygen. Keeping ice off part of your pond is crucial. The fact is, keeping your goldfish alive outdoors during the winter requires year-round diligence -- but not a lot of your time. Keeping your goldfish alive through the winter starts in the summer. Give a high-protein food to help them build up fat stores that will sustain them during hibernation. When the weather cools below 60 degrees Fahrenheit in the daytime, change the food to an easy-to-digest wheat germ variety. When the weather falls below 50 degrees, the fish are unlikely to need food. If you see food floating after your cooler-weather feedings, stop feeding until the weather warms. Ice is an enemy in winter. If your pond is at least 3 feet deep, it's unlikely to freeze completely. However, even a thin layer of ice covering the surface traps harmful gases inside and keeps oxygen out. If those gases aren't allowed to escape and be replaced by oxygen, the fish will suffocate. Solve this problem by pouring warm water in one section of the pond to melt the ice or by placing a pan with hot water on top of the ice to melt through it -- be sure to remove it once the hole is melted. The hole doesn't need to be large. About 12 inches in diameter is usually sufficient. But it needs to remain open all winter. If you notice the fish braving the colder waters to swim near the hole, this means not enough oxygen is in the lower levels. The hole needs to be bigger. A floating deicer can help you keep an air hole open in the ice of your pond. It contains a heating element to keep ice from forming in the area immediately around the device. It won't protect the entire surface or heat the water for the fish, but it's effective at keeping small areas ice-free. If you're leaving in the pond plants that have roots underwater, placing a deicer near the stems can keep the ice away from the plants while it leaves an air hole in the ice. Bring potted tropical plants such as birds of paradise indoors to help them survive winter. Even if the foliage dies, it often comes back from the tubers or roots when the weather warms, when you can move the pots back to your pond. Many plants that have roots underwater, such as water lilies, can survive cold winters and don't need to be removed, even if they're in pots underwater. Clean out the pond to remove as many leaves, twigs or other debris as possible. As these decompose in the water, they remove oxygen that the fish need. Many pond pumps and filter systems aren't designed to work in cold temperatures. If your pond uses a filter or pump, check your system's specifications to find its lowest operating temperature, and turn it off when it gets too cold for the system to operate properly. If you let it run when the weather is too cold, it can freeze and ruin. If you have a system that can run throughout winter, make sure it pulls water up instead of moving water from the surface to the bottom. 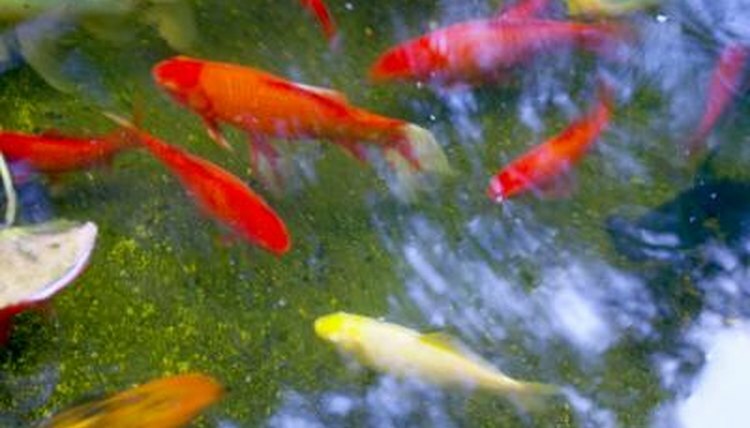 Deeper areas of the pond tend to stay warmer than the surface, and your goldfish will congregate in the warmest areas. If your pump moves cold water from the surface into the deeper areas, your fish could die. Can Koi Live in a Pond if It's Frozen on Top? Can Fish Breathe Without a Pump in the Tank?